This site commemorates the men and women of Collingham, Linton and Micklethwaite who served during World War 1. On the 29th September 1916, the death of the Vicar of Collingham, the Rev. Charles E. Medhurst was announced in The Wetherby News. Death of the Vicar of collingham. The death took place yesterday (Thursday) morning, of the Rev. Charles E. Medhurst, vicar for ten years of St. Oswald's, Collingham, before that for two years vicar of Thorparch, and prior still to that vicar of Smethick, in the diocese of Lichfield. At the latter place he worked exceedingly hard and did good work, with the result that his health was undermined. Here Mr. Medhurst had charge of a parish, single-handed, of about 10,000 souls, and built mission room, church schools, etc. The rev. gentleman was an M.A. of Durham University, and at the time of his death was 56 years of age. He had been in failing health for fully two years, but more so particularly during the last few months. He leaves a widow, two sones (one married), and one daughter who married a son of the Bishop of Beverley, her husband now being in Egypt. The younger so is a Flight Commander in the Royal Flying Corps, and has been mentioned in despatches for gallantry. Deceased, who was a connection of the Hastings family, was a member of the Lady Hastings' Trust. We understand that the internment will take place at Collingham. The search for the next vicar then started and by the 9th February 1917, the Rev. Philip J. Kelly was being installed as the next Vicar of Collingham. In the presence of a large congregation the Rev. P.J. Kelly, M.A., late Rector of Whitwood Mere, was instituted to the living of Collingham by the Lord Bishop of Knaresborough, and inducted by the Rural Dean, the Rev. M.G. Lascelles, M.A., at three o'clock on Saturday afternoon last. The clergy, having robed in the Vicarage, were met at the Church gate by the choir. A processional hymn was sung immediately the choir entered the Church. The quaint ceremony was followed by an interested congregation, to whom later the Bishop in his remarks made a strong appeal for sympathetic cooperation with the new Vicar. He emphasised the fact that the pastoral work of a parish was not entirely the work of the parson, but that likewise the people had their responsibilities, and can do much to help their Vicar in his work. The following clergy were present in addition to the Bishop, the Rural Dean, and the new Vicar:- The Rev. C.V. Stillingfleet, rector of Kirk Deighton; the Rev. T. Humphrey Edwards, vicar of Bardsey; the Rev. J.P. Whitworth, vicar of Thorner, and the Rev. J.P.D. Chapman, curate-in-charge at East Keswick. Mr. Hamar was an efficient organist, and the work of the choir was much appreciated. Philip James Kelly had been born on the 24th August 1881 at Rushen on the Isle of Man, the son of William Kelly and his wife Ann (nee Roberts). Philip was educated at Cambridge University, being at Queen's College in 1902 and obtaining a 2nd Class degree in the Theology Tripos in 1903. Philip Kelly had been at North Ormesbury, 1905-1907, Hessle, 1907-1910, St. Mary Walkley, Sheffield, 1910-1911 and Rector of Whitwood Mere, 1911-1916. In 1909, Philip married Ellen Conway in Middlesborough and they had 4 children - Nancy and Joan Conway Kelly, both born in Hessle in 1910, William Frederick Paul Kelly, born in 1912, and Phillipa Kelly born in 1914. When Philip moved to Collingham in late 1916, he came to the Vicarage with his wife and a number of young children. THE VICAR SAID TO HAVE JOINED THE ARMY. The sensational disappearance of the Rev. P.J. Kelly, vicar of Collingham, has been the one theme of conversation in the district since Friday last. What motive the rev. gentleman had for his sudden departure is open to conjecture, but most people attributed the disappearance to monetary trouble, though others are persisting that there was another reason for the quick departure of the rev. gentleman, but this story needs corroboration, and as susual many of the tales going round the countryside have been "improved." Nevertheless, the deepest sympathy goes out to Mrs. Kelly, who is left with six little ones under seven years old. Mr. Kelly was appointed vicar of Collingham in November last, on the death of the Rev. C.E. Medhurst, and within a month crowds flocked to hear him preach, and it was difficult to secure a seat at the evening service to hear his eloquent sermons. In fact people had to be present long before the services started. On Sunday morning week Mr. Kelly conducted the early morning service as usual, but failed to put in an appearance at Matins. Shortly before the time for the service to commence Mr. Kelly sent a message to the church by a friend from Castleford, Mr. Dawes, to the effect that the vicar was suffering from a sharp attack of neuralgia and had expressed a wish that he (Mr. Dawes) should take the service. Mr. Dawes having previously officiated as a lay reader at the church it was agreed, after consultation among the churchwardens and sidesmen, that he should be permitted to read the prayers and conduct an abbreviated form of service. Later in the day arrangements were made as a result of which the evening service was conducted by a vicar from Leeds. "Dear Mr. Twidale, - When you read this I shall be on my way to the recruiting office and this may be good-bye. I have resigned my living. "Will you kindly make provision for duty in the future? Get in touch with my wife. Good-bye - Yours sincerely, P.J.KELLY." The letter was dated Sept. 16th (Sunday), but it was not received by Mr. Twidale until he returned home from Leeds on Monday evening. This letter came as a great surprise to the churchwardens and parishoners, who had no knowledge of the Vicar having any idea of leaving. On the same day as Mr. Twidale received the letter the Vicar left the Rectory about six o'clock in the morning, and it is believed that he cycled to Bradford, for he is supposed to have sent his bicycle back to Collingham from that place by rail, and it is reported that he has been also seen at Chester. Mr. Kelly was inducted to the living last December, and during the time he has been in the parish has been very well liked by everyone, particularly so perhaps because he was such a forcible and eloquent preacher. In the words of one of the Church officials, he "took the place by storm when he first arrived." The same gentleman went on to say that during the last few weeks the Vicar had not seemed to be Himself. He appeared to be changed in his manner and always seemed to have something on his mind. The parishoners are very reluctant to say anything about the cause of Mr. Kelly's disappearance, but here and there may be found people who say that there may be "good reasons" for it. Mrs. Kelly declines to make any statement in explanation of her husband's absence, but it is understood that she has confided to a friend that she "is not sorry that things have at length come to a head." She remarked to Mr. Twidale on Monday week, however, that it was a terrible thing for her to be left alone to face the world with such a large family of young children, and the peoples' warden assured her that she had the sympathy of the whole of the parishoners in her trouble. On Saturday afternoon the Rural Dean, the Rev. M.G. Lascelles, met the churchwardens to discuss the situation which has arisen, and on Sunday the services were conducted by the Rev. Herbert Beckwith, the son of a former vicar of the parish. The parishoners did not give much credence to the theory that the vicar may have joined the Army, although he had said from the pulpit on one occasion that as a man of military age he was quite prepared to go into the ranks at any time, as they might think he ought to be fighting instead of preaching. It is also understood that the vicar offered his services in connection with the war, but had not been permitted to leave the parish by the Bishop of the Diocese. Mr. Kelly had also told some of his parishoners that he would like to take up work under the National Service scheme. It is stated that Mr. Kelly had been away from the village a good deal lately, giving reading lessons, only returning to Collingham for the week-end. In this month's Parish Magazie the Vicar made reference to some work that he had been asked by the military authorities to undertake. In his "Monthly Letter" he wrote:- "With the future still uncertain I find it impossible to make any arrangements for the winter. I have been asked by the military authorities to undertake some work which will keep me occupied, but the necessary confirmation of my acceptance is not yet to hand. I shall be able to take the Sunday services and urgent week-day work will be undertaken by the Rural Dean." After asking that all baptisms should take place on Sundays and funerals as far as possible on that day also, he depreciated the slight falling off in the attendance at Holy Communion and appealed to his parishoners to make a little extra effort. "I shall continue on Sunday mornings," continues the letter, "our studies on the life and character of Our Lord and, as far as I can on Sunday evenings, will deal with subjects which special events may suggest. As you are already aware, my chief aim is to help you to realise that Christianity is not a kind of sentimental something which makes us feel nice inside but the sanest expression of practical common sense." Educated at Queen's College, Cambridge, the Rev. P.J. Kelly had a brilliant career, and took his M.A. degree last year. Ordained as a priest in 1906 his first curacy was at Holy Trinity, North Ormesby, Middlesbrough, where he remained for two years. Subsequently he held curacies at Hessle (Hull), and at Walkley, Sheffield, and in 1911 he was preented with the living of Whitwood Mere, Castleford. He remained there until his appointment to the vicariate of Collingham Bridge in December, 1916, and he was always very popular amongst the mining people who were his parishoners. The living of Collingham is worth £500 a year in addition to the rectory. Mr. Kelly took a great interest in the Boy Scout movement locally. He is a man of wide literary tastes, and wrote a novel entitled "Paul Kemley." The living is in the gift of Mr. Wheeler, M.P. The latest report is that the late Vicar is now in the Royal Garrison Artiller as Gunner "Jim" Kelly. We believe that the Rev. Philip James Kelly served as Gunner 180599 in the Royal Garrison Artillery. The Rev. P.J. Kelly Unfrocked by the Bishop. A sequel to the sensation caused by the disappearance of the Rev. Philip James Kelly, Vicar of Collingham, who joined the Army as a gunner in the R.F.A., was heard on Friday, when that clergyman was unfrocked at a Consistery Court held at Ripon Cathedral. The Court was called in the terms of a notice "to give sentence on the Rev. P.J. Kelly upon his confession of immoral conduct." The Bishop of Ripon (Dr. Drury) presided, and the Court also included the Rev. M.G. Lascelles (Vicar of Harewood and Rural Dean of wetherby). The Registrar of the Court briefly announced that the regulations of the Clergy Discipline Act had been observed by Mr. Kelly, in admitting the offence and consenting to sentence being passed. The Bishop, before passing sentence, emphasised most strongly the serious nature of the offence committted by Mr. Kelly, the scandal and sorrow caused in the social life of the village, and the hurt done to the church of God. It was, he said, a most painful duty laid upon him to exercide the discipline entrusted to a Bishop to carry out, but he could not do otherwise. The Rev. 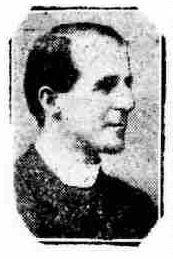 Philip James Kelly, clerk in holy orders, vicar of the parish church of Collingham in the diocese of Ripon, who has consented under the terms of the Clergy Discipline Act of 1892 to my giving sentence upon him: I hereby, in the exercise of the authority committed to me as Bishop of this diocese, pronounce that the said Rev. Philip James Kelly be deprived of the vicarage and benefits of Collingham on the ground of gross moral misconduct, and further declare him to be incapable of holding any church preferment until such time as it may seem fit to those who have authority in the matter. Mr. Kelly left Collingham Hurriedly to join the Army, and he is now serving in the Royal Garrison Artillery. On the Sunday before his departure, he did not take service at the Church, pleading indisposition, but the real reason was probably that he feared the possibility of being denounced from the body of the church. He left a wife and six children. We were informed some weeks ago by a Wetherby lady, that when travelling to Llandudno on the day Mr. Kelly disappeared, she saw him leave the train at Manchester in the company of a lady. These events were also widely reported around the country with the Driffield papers ending their article with "Mr. Kelly when he disappeared left a wife and six young children at the Rectory. Contemporary with his departure from the district was also that of a young lady" and the Chester Chronicle reporting "Mr. Kelly, when he disappeared, left a wife and six young children at the rectory. Contemporary with his departure from the district was also that of the daughter of a retired clergyman, who up to the time of her disappearance was a V.A.D. nurse." THE REV. GUNNER P.J. KELLY. The Rev. Philip James Kelly, vicar of Collingham, Yorkshire, who left his parish living worth £500 a year, about a fortnight ago to enlist, is serving in a signalling section of the Royal Garrison Artillery at one of the forts in the vicinity of Portsmouth. His wife and six children are staying in the neighbourhood. Seen yesterday the Rev., now Gunner, Kelly, who was, of course, in khaki, looked very "fit" and he appears perfectly well satisfied with the step he has taken. "I have always held and preached," he said, "that it is the duty of the clergy of military age to serve in the Army or Navy as combatants, either in the ranks or as commissioned officers. That was my principal reason for joining the ranks." He added that during the last three years he had been anxious to join up, and had at last done so. Accordingly, on leaving Collingham, he went to Chester, where he enlisted. That was on September 21, and he had been sent on to his present depot for training. He had only joined for the period of the war. Replying to a question as to how he liked soldiering, Mr. Kelly said he found it "a bit rough," but he got on wonderfully well with his comrades. In fact, he said, there was a fine spirit of comradeship among them, and he found many men of superior attainments in the ranks. The pulpit is on the right, but was originally on the opposite side. At 8.20 pm on 10 December 1940, a bomb landed in the nave, in front of the lectern, destroying the east window and all the other stained glass in the church. A confirmation class had recently gone to the cellar of the vicarage, then situated in what is now St. Mary's Close. Revd. Philip Kelly collected the pieces and gave them to the art gallery for safekeeping. The incendiary bomb destroyed the roof and many internal features, although the structure was unaffected. The Rev. Philip James Kelly died in 1956 and is buried in Acocks Green. © Alan Berry 2017 - 2019. All rights reserved.